The Société de Mathématiques Appliquées et Industrielles (SMAI) is a non-profit organization governed by the French 1901 law. It was created in 1983 by a group of French applied mathematicians having become aware of the specifity of their discipline and wishing to insure its expansion and development. The goal of the Society is to contribute to the development of applied mathematics through research, industrial applications, publications, education and the training of researchers and engineers. The association is governed by an Administration Board which is elected by the General Assembly and which elects, within it, an Executive Committee (Bureau), according to the by-laws and the internal rules. The SMAI has also a Scientific Advisory Committee. Christophe Chalons (former General Secretary) is also renewed as members of the Bureau to facilitate the transition of responsabilities. Besides, the Administration Board appoints representatives for specific tasks of a limited duration. The dynamism of the SMAI, the launching new projects and the writing of reports about various issues depend very much on their contribution. 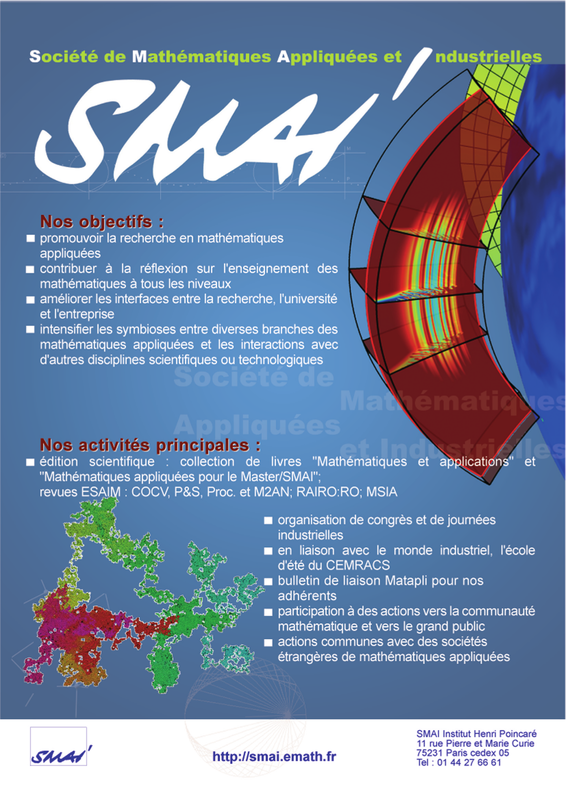 Some of the SMAI activites are organized by its thematic groups.